You can now pass input data to all tools via ?input-url=URL query argument. 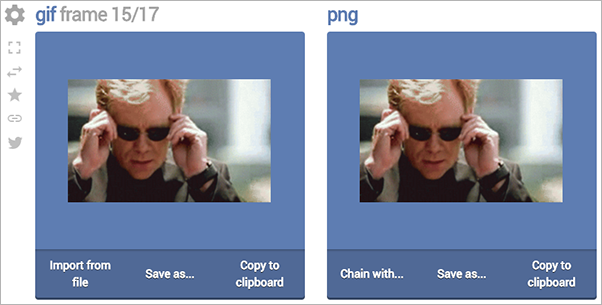 Check out this example - Load a GIF from Giphy and extract 15th frame from it as a PNG. Input-url query argument also works with chaining. 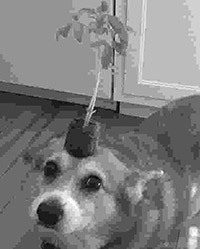 Here's an example - Load a good boi JPG from Imgur, flip it horizontally, convert to grayscale and change JPG output quality to 5%. Image tools also accepts input images as Data URI encoded data via ?input argument. Here's an example - Resize a base64-encoded 32x32 pixel image to 64x64 pixels, pixelate the result, make the image transparent, crop it to 192x64 pixels, add "Hot!" italic text to the right. Input-url query argument also works for text tools, not just image tools. Here's another example - Load digg.com/robots.txt text file, drop empty lines, apply a regex that extract just values, drop non-urls, and then sort them. In this example ?input-url is digg.com/robots.txt. And text tools also support plain text input via just ?input argument. For example - Remove all leading slashes from digg's robot.txt urls. In this example input is loaded via ?input=... query string. Awesome work team Browserling and see you all next time!